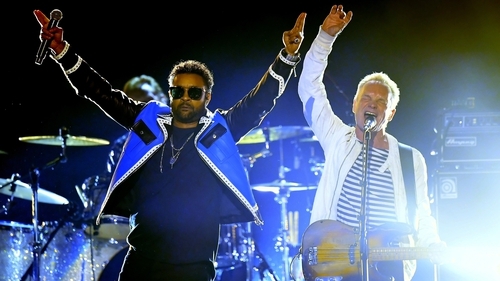 Sting and Shaggy are releasing an album. Together. This is not fake news. So to help us get out heads round this rather bizarre turn, Sarah McIntyre looks at some of the most unexpected, and, at times, downright perplexing, pop collaborations of all time - ranked from best to worst. 2018 has started off with a bang in the world of unusual pop music team-ups with the news that Police singer Sting is making an album (yes, an entire album) with It Wasn't Me hitmaker Shaggy. We didn't see this one coming either. The duo debuted their unlikely partnership at the Grammys last week and it was surprisingly pleasing to the ears. They played a mix of Sting's 1987 hit Englishman In New York and their joint single Don't Make Me Wait. Their full album, which is inspired by a mutual love of Jamaica, will drop in April. Have a listen to the debut track below and see what you think. In honour of this new musical partnership, we've rounded up the most unlikely, can’t-imagine-them-in-the-same-room pop hook-ups in living memory. Well this was unexpected. Indie rockers Weezer and Chamillionaire, the rapper who broke onto the scene with his 2006 hit single Ridin', teamed up in 2006 for this unconvincing ode to partying. We're sure it's meant to be tongue-in-cheek, but River Cuomo's delivery of lyrics such as "I gotta have Patrón, I gotta have the beat, I gotta have a lot of pretty girls around me" is so deadpan it turns into a bore, and Chamillionaire's verse only barely ups the ante. This is a skipper for sure. Then teen popstar Justin Bieber, pre-Purpose makeover, recorded a cover of the festive classic Little Drummer Boy with Gimme Some More rapper Busta Rhymes for Bieber's 2011 Christmas album Under the Mistletoe. Besides the fact that the world probably didn't need another rendition of Little Drummer Boy (I mean, the Simpson sisters had it nailed with their hilariously ear-splitting version), the combo of Bieber's warbling voice and Busta's typical rapid-fire delivery just . . . doesn't quite work. None of us are here for Bieber trying his hand at rapping either. And another Little Drummer Boy cover . . . this one has to be one of the weirdest duets of all time. Crooner Bing Crosby and avant-garde artist David Bowie teamed up to record a duet for Crosby's Merrie Olde Christmas TV special in 1997. The clip opens with a hilariously awkward skit where the singers pretend to be neighbours before breaking into song. We have to say, this has a lot more charm than the Biebs/Busta version but it's still a bit of a head-scratcher. Miley Cyrus and The Flaming Lips - Doo It! Where to start. Pop artist and former Disney darling Miley Cyrus and veteran psychedelic rockers The Flaming Lips teamed up for a collaborative album back in 2015 and Dooo It! was the opening track. The fairly minimal production puts Cyrus's lyrics to the forefront. "Yeah I smoke pot, yeah I love peace, but I don't give a f***, I ain't no hippy," are the opening lines and we just can't get on board. Combine that with the gross-out, borderline unwatchable video featuring a close-up of Cyrus's face dripping with a variety of substances including glitter-goo and cake sprinkles for four-plus minutes, this is just not a goer. Oh my. English boyband 5ive decided to record a cover of Queen's 1977 anthem We Will Rock You for their second album Invincible in 1999, and rather than leave them at it, Brian May and Roger Taylor decided to hop on board on guitar and drums respectively. There's not much good we can say about it, apart from the fact we're getting some serious nostalgia vibes from the video which features some choice eyebrow piercings, expertly-gelled spikey haircuts and full-length studded leather jackets. And some very questionable rapping from the 5ive lads. This 1984 slice of cheese featuring Janet Jackson and Cliff Richard is so bad it’s hard to make it the whole way through the three-minute duration. Bland doesn't begin to cover it. It sounds like it was specially written for a montage-sequence in a 1980s rom-com, which might be the only scenario in which it'd be tolerable. Pass. Kelis deserves so much better than this. This singer joined forces with Enrique Iglesias on his 2004 single Not In Love, which was released around the time of two of her biggest hits, the irresistible Milkshake and unstoppably catchy Trick Me, and the result is just a bit blah. Another who? While Jay Z went on to become one of the biggest rappers of all time, you'd be forgiven for having forgotten all about English R&B boyband Another Level, who were together for three sweet years in the late '90s. Rather surprisingly, they teamed up with the legendary New York rapper for a remix of their single Be Alone No More. This smooth pop track might not be one of Jay Z's finest moments, but it's really not half bad. Early noughties boyband Blue recorded a cover of Elton John's 1976 hit single Sorry Seems to be the Hardest Word for their second studio album, One Love, with Elton himself lending his vocals and piano playing. It headed straight for the number 1 spot, so it must have some fans. It's not a particularly offensive re-imagining and we're actually quite partial to the video, which could only belong to the early 2000's. Yes, Irish boybanders Westlife did really collaborate with pop megastar Mariah Carey back at the dazzling height of their musical career, and this cover of Phil Collins' hit Against All Odds (Take a Look at Me Now) features plenty of competitive warbling. The thrown-together video is notable for some classic late 90s cheese, including plenty of shots of the baby-faced lads on a boat moodily starting off into the distance at the sea. A very listenable track, in all fairness. So wrong it’s right?! Scottish pop-rockers Texas, led by the impressively voiced Sharleen Spiteri, and rapper Method Man from the Wu-Tang Clan teamed up for a remix of the band's hit single Say What You Want and it's surprisingly appealing in a chaotic mash-up kind of way. Here they are performing it at the Brit Awards in 1998 with plenty of vigour. The track was released as single and went to number 4. Not too shabby. Rihanna's single FourFiveSeconds took fans by surprise with a big musical change of direction of the Barbadian star in 2015. Rapper Kanye West lends his vocals to the pared back track, but much more notably, legendary Beatle star Paul McCartney plays guitar and is one of the co-writers. The super catchy but simple track headed to number 3 in the charts, marking McCartney's first top-ten hit since 1989. We're big fans. We have to admit to having a major soft spot for this one. Rapper Jay Z teamed up with nu-metal rockers Linkin Park to record the six-track EP Collision Course in 2004 which featured mash-ups of tracks from both of their previous albums. It was inspired by The Grey Album by Danger Mouse, which was a collection of Jay Z and Beatles mash-ups. The highlight of the bunch is Numb/Encore, which even won a Grammy. It works seamlessly, perfectly combining both musical styles. A treat. Aussie pop princess Kylie Minogue lent her vocals to this duet with Nick Cave and the Bad Seeds back in 1995 and the result is hauntingly beautiful in every way. Nick Cave wrote the song specifically with Minogue in mind and the collaboration is pure perfection, from the tragic narrative of the lyrics, to the emotive orchestral accompaniment and the impeccable visuals. Just magnificent. Is this the original surprise collaboration to beat them all? Hip-hop group Run DMC and rockers Aerosmith joined forces for a cover of the band's classic 1975 hit Walk This Way in 1986, revitalising Aerosmith's flagging career and becoming an international hit that paved the way for other genre-melding efforts. Over 30 years later, the track and video are as entertaining as ever. A complete banger - put the volume up to 11!